Shingles symptoms are caused by a virus called varicella-zoster. Although the symptoms are painful, they are not usually dangerous. Shingles is also known as herpes zoster. It's different from the herpes virus that causes genital herpes and cold sores. Shingles is caused by varicella-zoster virus (VZV), the same virus that causes chicken pox. When a person gets chicken pox, he gets an itchy, all-over rash. That rash heals in a couple of weeks, and the person feels better. But the virus can hide out in the person's nervous system. Years later, it can re-appear as shingles. Shingles is most common in people over age 50, but younger people can have it, too. It may appear when the immune system isn't functioning well, such as when you are already sick or feeling stressed. On the other hand, it can also appear in someone who's perfectly healthy. Shingles itself is not contagious, but someone with shingles can infect others with chicken pox. It's important to stay away from anyone who hasn't already had chicken pox or a chicken pox vaccination. People with shingles should also stay away from pregnant women, because chicken pox can be dangerous for a developing baby. Once, the shingles rash has scabbed over you can no longer spread chicken pox. Pain limited to one part of the body. It may be in your face, in a band on your side, chest, and back, or somewhere else. It usually affects only one side of the body. A rash with fluid-filled blisters. The rash may look like chicken pox, but it's painful rather than itchy. The rash tends to appear a few days after the pain begins and to cover the same area. If you think you have shingles, make an appointment to see your doctor right away. 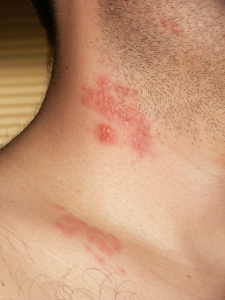 Treatment is available that can lessen the shingles symptoms and help you get better faster. The pain from shingles symptoms can sometimes feel like something more serious. If it affects an area of your chest, it can even make you wonder if you're having a heart attack. If you have chest pain or other worrisome symptoms, though, don't wait to find out if it's shingles. Get medical help immediately. Shingles appears in just one place, on just one side of the body, because the rash usually follows a single sensory nerve pathway. Sensory nerves exit the spinal column at different levels on the body. Each spinal nerve divides into smaller nerves which spread out in a wedge shape, picking up outside sensations in just one part of the body. For example, one spinal nerve covers an area several inches wide from your mid-back, around your ribs, and onto the front of your body. Doctors call this area the nerve's "distribution." If you look at the rash on someone who has shingles symptoms, you'll see that it follows a single nerve distribution. A prescription antiviral medicine such as famciclovir can help decrease shingles symptoms. Antivirals can also shorten the length of the illness, decrease the chance of complications, and make transmission of the virus less likely. Over-the-counter painkillers may be enough to help with the pain. If not, a doctor can prescribe stronger medicine until the symptoms begin to improve. If the rash is itchy, cool water or calamine lotion may help. Most of the time, shingles gets better and never comes back. In about 10 percent of people, the pain lingers for a month or so, even if the blisters have healed. About 5 percent will still have pain after three months. And about 3 percent will continue to have pain even after a year. This pain is called postherpetic neuralgia (PHN). PHN is much more common in older people. As many as 75 percent of people over age 70 will develop PHN after having shingles. The problem seems to be caused by damage to the nerves. The pain may be constant, or it may come and go. It may be triggered by a light touch or even a breeze. Treatment is directed at controlling the pain. Rarely, shingles can have serious complications. It can affect the eyes, sometimes causing blindness. In people who are very ill or have very weak immune systems, it can cause an infection of the brain. It can involve all or part of the spinal cord, causing weakness or temporary paralysis. Fortunately, for most people shingles symptoms are an unpleasant nuisance that does eventually go away.